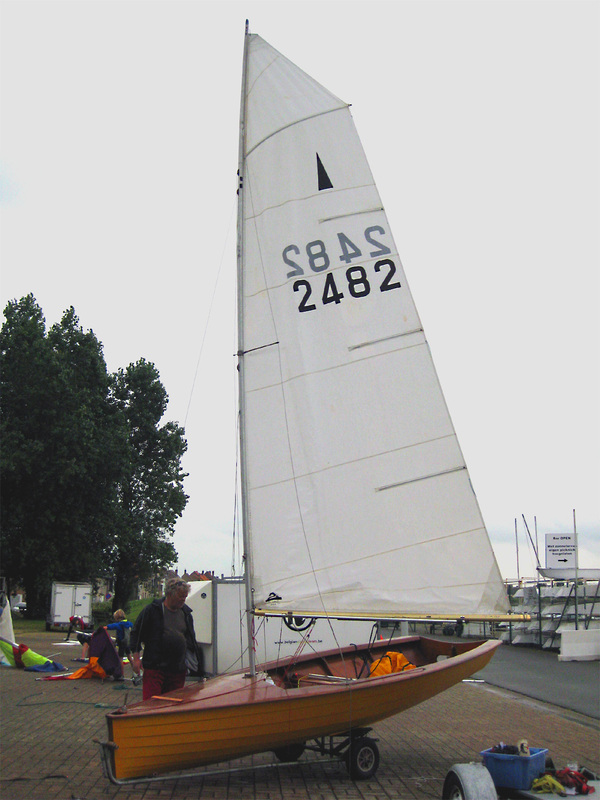 Since my spouse decided to come along sailing I was looking for a double-hander dinghy. A worn 420 would be the obvious boat to look for and fine to start with I thought, plenty of these to find but I wasn’t quite happy with the prospect of actually having to sail one. Suddenly a 70′ wooden Merlin Rocket appeared in the ‘Boats and bits for sale’ section of the CVRDA forum and I bought it. A 420 would have been a far more forgiving boat for a couple of newcomers, but we prefer wooden boats so were very happy to be able to acquire a lovely 2+meter wide classic wooden boat. It’s a Hotspur 206, built by the Aln Boatyard in around 1971. Hello, I remember that boat – ‘The Green Rock Machine’ – owned by Dave Rock-Evans. Aln Boatyard were superb builders of Merlin Rockets – they looked good and were structurally very sound and built to last, so I have no doubt that MR2482 will be in good condition for its age. The Hotspur was my first successful MR design, coming 4th in 1970 and in the hands of Patrick Blake, winning the Silver Tiller series in 1971. It is more ‘river’ orientated than my later designs and would make an excellent and competitive vintage MR.
A story be continued without any doubt. Two (or three?) weeks later after the boat got home I mended the side decks, sealed the fore deck where due, re-glued the sternsheet to the sternpost and re-glued some more wooden bits. Not to showroom condition but just enough (and a little more) to get us -and the boat- safe and sound on salty water for the remaining sailing season of 2014. Plenty of time to do proper woodwork later on. We got help from an enthusiast bystander for stepping the mast. Apart from loving the Merlin he certainly knew what he was doing, turned out he was a Dragon owner/sailor. Talking about meeting the right man at the right place. Rigging the boat went surprisingly swift for us novices, and after a final encouraging drink we took the boat to the water. Although with plenty of space on the lake and a mild steady wind force 3 we felt some anxiety. Me having never helmed a racing doublehander and my wife never having sailed anything. Getting into the MR from water deep up to the chest needed some coördinated choreography but once we set off it went well, so well in fact that we were both wishing after some tacks for the wind to pick up. We hadn’t expected such a comfortable ride. 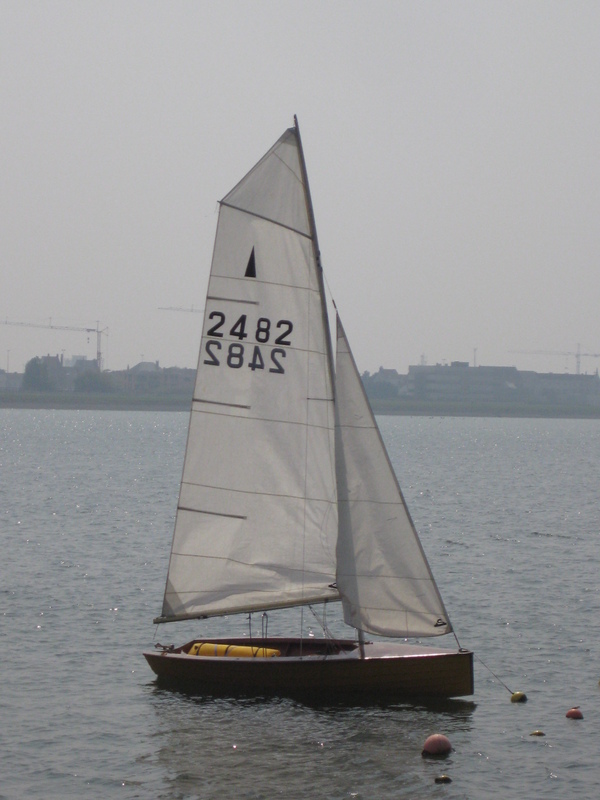 A great first sail it was and I think MR 2482 will be part of our small fleet for quite a while.